Uniformly and consistently increases electrode-to-skin conductivity. Eliminates hot spots and prevents electrode dryout during prolonged procedures. Replaces water and conventional media. Electrode Gel and Solutions can be found in our extensive online collection of products from globally recognized and trusted brands, including Pharmaceutical Innovations. 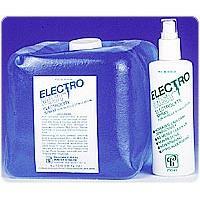 An excellent option to consider is the Electro Mist Electrolyte Spray for Muscle Stimulation.